The Dhyana Mandir here was the first mandir Gurudeva Sri Sri Paramahansa Yogananda started, to meditate with his friends. Divine Mother had answered the prayer of child Mukunda (the childhood name of Sri Sri Paramahansa Yogananda) who was in search of a suitable place nearer to his home at 4, Garpar Road where he could meditate along with his friends. Through the instrumentality of a boy of around his age named Sri Tulsi Narayan Bose this site at 17/1, P. B. Lane was made available for Mukunda’s spiritual activities. The property was formally procured in the year 1911. Upon receiving sannyas from his Guru Swami Sri Yukteswar Giri in 1915, Mukunda came to be known as Swami Yogananda. 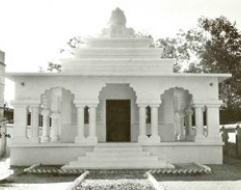 Sri Yukteswarji nominated Swami Yogananda as Director and Secretary of the Satsanga Sabha, that was founded by him and was subsequently relocated to this site. Gradually, a spacious three room adobe cottage with tile roof came up at this site that served as a centre for Yoganandaji's spiritual programmes. This centre came to be referred to as Satsanga Ashram. Weekly Satsangas under the banner of Satsanga Sabha were held here at 17/1, P. B. Lane that was attended by many ardent and illustrious devotees of Swami Sri Yukteswarji. The main activities of the Satsanga Sabha consisted of readings from the scriptures, devotional singing and kirtan, spiritual discourses, and group practise of Kriya Yoga meditation. The Satsanga Sabha hosted programmes during the annual Autumnal Equinox and on other auspicious occasions which were usually held at prestigious public auditoriums in Calcutta, such as: Town Hall, Albert Hall, and Raja Rammohan Roy Hall. Swami Yogananda’s idea of imparting education to youth along the lines of ancient spiritual ideals was also conceived here. To begin with, he started implementing his educational ideals by establishing an ashram school with just two small boys who were resident in the Satsanga Ashram. Swami Sri Yukteswarji would often attend the Satsanga Sabha celebrations and was a great inspiration to the boys and sevaks in the ashram school. Yoganandaji’s former Sanskrit tutor, Shastri Mahasaya (Hansa Swami Kebalananda), an exalted disciple of Sri Sri Lahiri Mahasaya, lived nearby and closely supervised the daily schedule of the boys and often stayed there at night. The Maharaja of Kasimbazar, Sri Manindra Chandra Nundy who in later years became the chief patron for establishing the Brahmacharya Vidyalaya at Dihika and Ranchi was in fact motivated to help Yoganandaji’s work mainly because of the positive impressions he gathered after visiting the Satsanga Ashram here and witnessing the ideal nature of the Gurukul style of training being imparted by Yoganandaji and the saintly Shastri Mahasaya. It was as a representative of the Satsanga Sabha that Swami Yogananda was invited to attend the International Congress of Religious Liberals to be held in October 1920 in Boston, Massachusetts, USA. Even after Gurudeva left for USA, weekly satsangas and Sabha meetings continued to be held here. Though modest in nature, the Satsanga Sabha during this time came to draw earnest spiritual seekers from far and near. Netaji Subhas Chandra Bose, a loved and admired public figure and a Kriya Yogi himself (in the lineage of Sri Panchanon Bhattacharya, an advanced disciple of Lahiri Mahasaya), had also felt inspired to attend the satsanga and participate in group meditation here. In 1937, a Yogoda Satsanga girls’ school and a meditation centre for women was established here that continued to function until 1943. Paramahansaji sent funds from America in 1951 to purchase the 17/1, P. B. Lane property and to construct a larger building here. 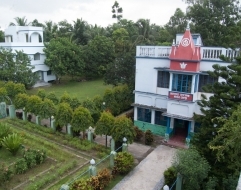 Later on, extensive remodelling of the building was undertaken and it was formally reopened on September 25, 1957 by Sri Jotindra Bimal Chowdhury, Secretary of the Bengal Sanskrit Association, for weekly group meditation and other spiritual programmes. Since 1957, this Yogoda Satsanga heritage site was named as Yogoda Satsanga Sakha Kendra — Garpar. Sri Sri Anandamoyee Ma, whom Yoganandaji in his Autobiography of a Yogi described as the “Joy-Permeated Mother,” also sanctified this place with her presence. During their visits to India since 1958, our then Sanghamata Sri Sri Daya Mata, and also our present Sanghamata, Sri Sri Mrinalini Mata, have conducted many satsanga and meditation programmes here. At present long meditations are held here regularly on Saturdays. Colourful Prabhat Feri is taken out on the occasion of Gurudeva's Janmotsav celebrations at which devotees and local residents participate joyously followed by a public function held at a nearby hall to communicate Gurudeva's immortal teachings which can be applied in daily life for all-round development of body, mind, and soul. Commemorations are conducted by YSS sannyasis on the occasions of Janmashtami, and Avirbhava and Mahasamadhi of the YSS Gurus. Group reading of Autobiography of a Yogi in English and Bengali is conducted on Thursdays. A charitable homeopathic dispensary has been running at this Kendra since 1991. In 2010 the dispensary has been expanded to meet its growing popularity in the locality.